Many of today’s automotive engines are complex, as they incorporate sophisticated technologies such as direct injection and turbochargers to squeeze more power and deliver better fuel efficiency from a smaller engine. Your engine may “prefer” premium fuel in order to run efficiently, but in some cases, premium fuel may be a manufacturer’s requirement. Generally, two grades of unleaded fuel are sold across the US: regular and unleaded. Regular typically produces 86 or 87 octane, while premium typically delivers 91 to 93 octane. Some gas stations sell a mid-grade blend returning 89 octane, while a few stations sell a super premium octane blend above 93 octane. 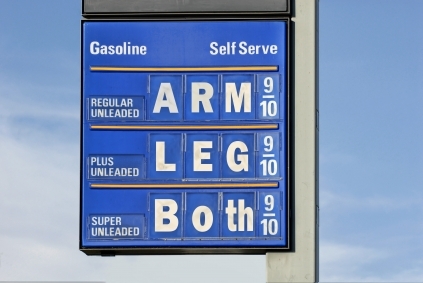 Premium gas also carries with it a premium price, usually costing twenty-five to fifty cents more than regular grade gas. That said, letting cost alone determine the best grade of gas for your car is a mistake. The higher the octane, the more efficient some engines run. Most late model cars can run on regular fuel just fine, but a loss of performance versus premium fuel is often the case. You’ll notice a difference when going from zero to sixty as your time may be off by several tenths of a second when using a lower grade. Late model cars come equipped with knock sensors to eliminate engine knock. If your engine knocks, a higher grade of gas may be needed otherwise damage could set in. Pinging and knocking should always be taken seriously. Regardless of what anyone says, follow your manufacturer’s requirements when it comes to fueling your car. If your owner’s manual says that premium fuel is required, then only use that fuel. If it says that it is recommended, then you can use a lower grade. Again, the difference here is between what is required and what is recommended—read your owner’s manual carefully because you don’t want to do something wrong by damaging your engine and perhaps voiding your warranty! Edmunds.com: Do You Really Need Premium?